NOW APPROVED: A recent proposal by Aurora Pacific named ‘the apple‘ is being called revolutionary because of its new urban characteristics. 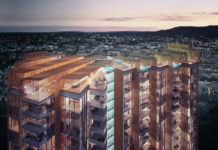 The development, located on 466 Ann Street (behind Mantra on Queen) plans to be the first of its kind in Brisbane’s residential market by offering a $3000 dollar scooter allowance. The project’s marketing is strongly focused on having the ability to “walk to work” while having “easy access to transport”. As the residential apartments in the tower are inspired by New York living, the exterior structure can be said to resemble modern Tokyo style architecture. The development will also see the construction of a new laneway called ‘Poppy Lane’. 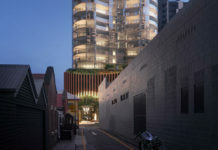 Designed by renowned architect Arkhefield, the compact-Japanese like residential tower will allow for the development of a mixed use laneway which will house a range of retail tenants. The DA submission noted the possibility of the following tenant mix: HOM – Cafe/Bar, Brisbane-based Derlot – Furniture & Industrial design concept store, Martini Bar, H.A.L – limited edition sneaker store, T-Bar – Limited edition t-shirt store and Dues Ex Machina – Motorcycle & fashion concept store. These retail tenants which are all new to Brisbane could be situated in the newly developed Perry Lane. Poppy Lane is being constructed to cater for the fast growing residential population around Brisbane’s Petrie Bight area and the northern quarter of the CBD. This development is in direct compliance with the Brisbane City Master Plan released in 2006 with a vision to support more people in the CBD in more sustainable ways. This part of the CBD is currently seeing a hive of activity with Meriton’s nearby 75 level Soleil tower expecting completion in 2012 and Urban Pacific’s Macrossan Apartment tower soon to be complete. Adding approximately 450 apartments within 200 meters from the Apple. The Apple will compromise of 56 apartments over 13 floors.